Despite nearly $3.4 million in poker tournament winnings, Alex Bilokur doesn’t look at poker as his money maker. Instead, the Russian is a successful businessman who plays poker as a hobby, looking for titles and bracelets in the process. And he accomplished one of his long-time goals by winning the Event #28 $10k Pot-Limit Hold’em title along with $398,567. 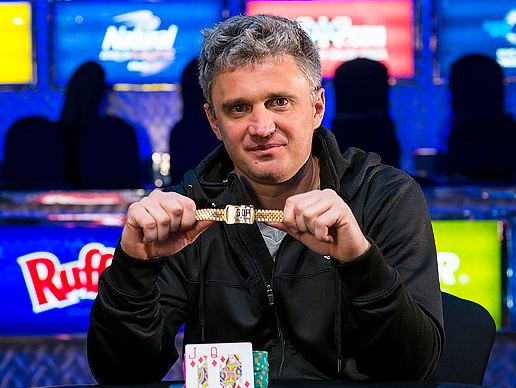 “It was my dream,” Bilokur said of winning his first gold bracelet. “It’s been my dream for a long time.” He beat out a 160-player field and a tough final table to secure the victory. Some of those who made strong runs in Event #28 included Barney Boatman (9th, $37,389), Richard Lyndaker (8th, $46,533), Todd Brunson (6th, $75,681) and Chino Rheem (4th, $131,705). As for Bilokur, he now has a gold bracelet to go with wins in a 2014 PCA Turbo ($202,720), 2012 EPT Prague Turbo ($94,732), 2012 PCA High Roller ($1,134,930) and 2010 EPT Berlin NLHE ($236,019) tournament. When the final table began in this $2,500 NL Hold’em event, a betting man probably wouldn’t have taken Pierre Milan to win. After all, the Frenchman had never ran deep in a WSOP tournament and was one of the shortest final-table chip stacks. Nevertheless, Milan combined good play with perfect timing as he won lots of big pots en route to taking down Event #29 and a $536,738 top prize. With the victory, Milan becomes the first French player to win at the 2014 WSOP. He also runs his career tournament winnings up to $639,599. Calvin Anderson’s first gold bracelet win couldn’t have gone any better. He amassed a lot of chips while battling through a 588-player field in this $1,500 7 Card Stud Hi-Lo event. Then he ran through the 8-player final table in just a few hours to win his first gold bracelet and $190,538. “I wouldn’t say it was easy, I just ran really good,” he said after the victory. Thanks to this win, Anderson now has $1,057,799 in live tournament earnings. He’s having quite a 2014 WSOP so far since he final tabled a $10k HORSE event (8th, $50,966) and took 14th in a $25 Mixed Max tournament ($63,158). Assuming he can string together a few more good finishes, he’s a contender to win the WSOP Player of the Year award.